I’m well. Something trips up. I start to fall, fall, fall. I crash hard. I pull myself together. I get up. I get stronger, better, happier. I’m well again. I’ve done this a hundred times in my 25 years. I’m an expert. But when I did this last fall, something was profoundly different in the recovery process, and I have no idea what it was. I’ve tried writing out this story at least two dozen different ways. Maybe I’m not ready to explore this topic, the memories of the last 9-10 months, but the blog manager in my head is very insistent on sharing something before Mental Health Month ends. So here we go. I need to give it a try. Last fall was one of the hardest crashes I’ve ever had. When I was at rock bottom, I was in a very primitive, protective mode to care for my mood, my feelings, my soul. Spending time with friends on weekends took all of my energy. Going to doctors’ appointments was exhausting. I slept up to 14 hours a day. I had a knot of anxiety in my chest more often than not. One of the only things that soothed me was watching the television show ER. It aired in a three hour block every weekday on Pop TV and it was the one thing I looked forward to every day. 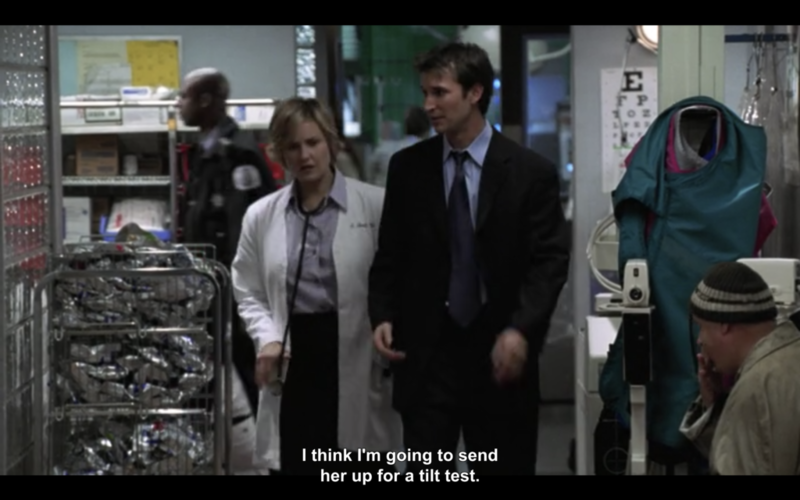 The highlight of 15 seasons of ER for me: when Carter orders a tilt table test for his grandma and diagnoses her with Shy-Drager Syndrome, aka Multiple System Atrophy, a form of dysautonomia. I remember crying in my therapist’s office once because I felt like I needed more than those three hours—I asked her to give me permission to ask my parents to buy season passes on Amazon. (It wasn’t available on Hulu at the time and I was too scared to ask my parents for a season pass without my therapist’s support.) She told me I would be just fine without it, so long as I kept my mind active. She made me come up with lists of other things to keep me distracted from the horrific thoughts occupying my head at the time. The thoughts ranged from general hopelessness to vivid suicidal ideations to long lists of reasons why I was unlovable and everywhere in between. Even though when I’m healthy I have the skills to combat each and every one of those thoughts, I could barely function at the time. I couldn’t go through those exhaustive processes to defeat the thinking. Our strategy at the time was to divert and distract. There were a few events in the fall that required me to save up all of my energy and put on a happy face. And some of those times, I was genuinely happy. But the crash afterwards was hard. Occasionally, going back to feeling horrible hurt even worse than if I had never had the good time at all. I don’t know when it was, I can’t pin point when it happened, but in the climb out of this depression, I felt more stable than ever before in my life. It was like I had again seen the depths of what my depression was capable of, and now that I was watching myself climb out of it, I was seeing my own strength, and really recognizing it for what it was for the first time in my life. But one day in November, I decided to stop at Trader Joe’s on the way home from therapy and TMS. I liked the feeling of being out of the house. I liked the freedom. I started going to Target on the way home from appointments for the same reason, and strolling around for up to an hour, just to stay out of the house. One day, I responded to every single one of the e-mails and text messages I got. One day, I went to an event with my parents and talked to people I didn’t know. And one day, I didn’t need to watch my three hour block of ER. To outsiders, these were small, tiny steps. But to my parents and care team, they were huge. I kept taking the small steps consistently. 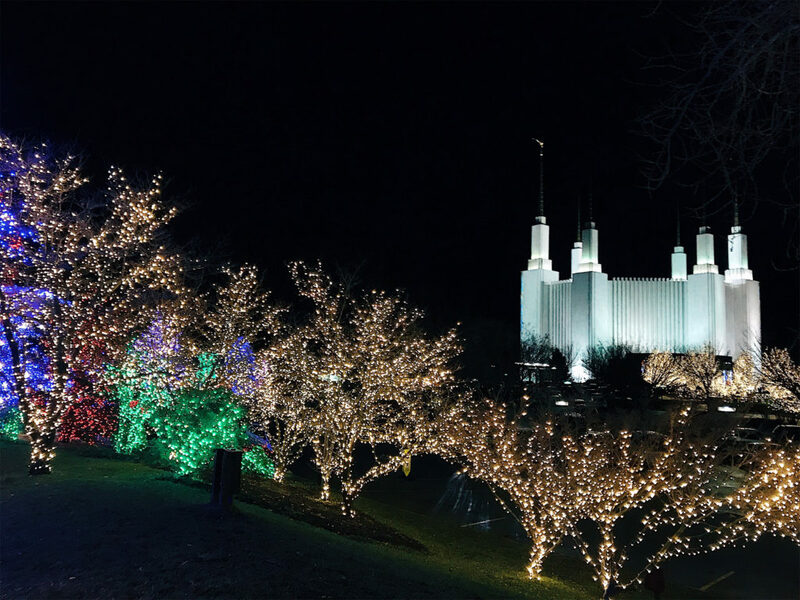 My friends and I went to the LDS Washington DC Temple Lights a few nights before Christmas. It was beautiful and literally and metaphorically electrifying. I felt so good to re-engage with the world, especially at the holidays. In January, my TMS psychiatrist told me we would try going without TMS for a while. To see how I’d do. I started making new, bigger steps. I started going back to church, because I wanted to explore that area of my life again and I enjoyed the social component. We started talking about some scary topics in therapy—but I could handle them this time rather than crumbling under the pressure. I started very casually looking for jobs. And in March, I got one. I hope your day was wonderful, and/or that tomorrow will be even better. & thanks to my support sys for being the best in the biz. I Tweeted this the day I got my job. The entire time while I was making these steps, I would look back at how far I’d come, and the word that came to mind time was stable. I wasn’t always happy. Suicidal ideations still came and went and I’d have to work through them. Therapy was hard. Really hard. But I was a different person than I was last fall. Much more like the person I wanted to become. Again, I don’t know what it was. I don’t know what meds change it was. I don’t know what TMS protocol it was. I don’t know what conversation it was in therapy, what day it was, what thing it was my therapist told me that brought me this stability. I do remember when the suicidal ideations stopped for a long period of time. I listened to a song from the Broadway musical Natasha, Pierre & the Great Comet of 1812 called Dust and Ashes in February, and it’s like it literally kicked the ideations out of my head for months. When I told my psychiatrist that a song from a musical based on Tolstoy’s War & Peace helped me defeat suicidal thoughts, he congratulated me on being the first person that Tolstoy’s writing had ever helped with depression. But beyond that singular moment, this recovery process has been the culmination of months and months (well, years) of progress. And honestly, that moment when the suicidal ideations went away was probably the result of months of work, too. Because now, I stand strong. It takes so much more to shake me. I tackle the big and scary in therapy. I can take on more without wearing myself too thin. I can find ways to express my pain, my grief, in healthier ways. Crying as a release feels good, and doesn’t snowball into a panic attack anymore. Writing comes easier—even if I don’t like the end results, I am able to find the words to begin with. I like time spend alone driving, so I can sing as loud as I possibly can to my favorite playlists. I finally feel like a 25-year-old, living a 25-year-old’s life—going out to dinner with friends, buying the things I want with my own money, talking and griping about work but still enjoying my job, having my own car… I feel fully alive. Last fall, I thought that I was out of options. I was afraid that the meds, the TMS, the therapy, weren’t going to work anymore. Those were the lies my brain were feeding me. I was prepared to throw in the towel, whatever that meant. Life still needs a lot of work, but it’s doable. I can breathe now. And now when I watch ER, it’s because I love the show, not because I need it to survive. 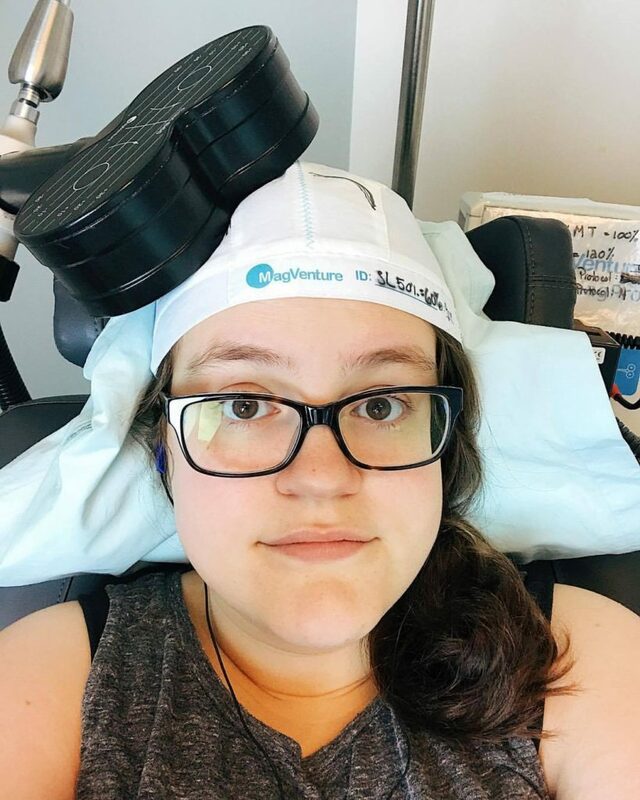 Two years ago, I told you about my experience with TMS, Transcranial Magnetic Stimulation. I told you how it pulled me out of depression like nothing I’d ever experienced before. How I relapsed, but I was waiting on insurance to approve another round. Since then, a lot has changed. In the Fall of 2016, I started a steady pattern of TMS that lasted a little over a year. We tried lots of different patterns, protocols, treatments. My doctor has been incredible, generous, patient, and kind. The technicians at my treatment center have been next level wonderful to me. And last January, while I wasn’t feeling as fantastic as I did after my first round, we decided to give TMS a break and see how I’d do. I stabilized. I’ve been steady for months. (Knock on wood, pray we don’t jinx anything.) I stumble a lot, but I keep picking back up. And I firmly believe it’s because of this last year’s work. I reference TMS ALL the time, and wanted to answer a lot of questions people might have. And even if you don’t, here’s some answers anyway. TMS is a type of therapy for treatment resistant depression. It sends magnetic pulses to parts of the brain that control your mood. TMS Therapy works by delivering magnetic pulses to specific areas of the brain involved in mood regulation – areas known to be underactive in those diagnosed with MDD. The magnetic pulses stimulate brain cells, thereby improving the brain’s ability to regulate mood. Kind of. Really, it’s more annoying than painful. It feels like a woodpecker is tapping at your head and trying to get through your skull to get to your brain. It’s frustrating. It sounds weird. But you get to watch TV, so that’s a plus. The first few sessions leave you a little sore and uncomfortable, but Advil will fix it right up. I can’t stress enough though how fast you get used to it. At first, I swore up, right, down, left that I’d never be able to withstand that awful machine. By Week Two, I was taking naps during treatment. brain magnet level: expert. fell asleep during TMS today. Scalp discomfort, headache, neck pain. There is a small risk of seizure with TMS, but those who administer it are trained in how to respond. So, is this ECT (electroconvulsive therapy)? ECT uses electrical currents to induce seizures and “restart” your brain or reverse a lot of symptoms of depression. TMS sends magnetic pulses to your brain to stimulate different parts of your brain associated with mood. You are awake the entire time you have TMS and have full control of your faculties. For me, yeeeeeeep. And for a lot of people, yeeeeeeep. How long do you have to get treatment for? The standard course of treatment is 5 days a week for 6 weeks, and then a few extra visits to taper off and for maintenance. Your doctor will decide on what “protocol” to give you. I’ve had many protocols… the most standard is probably a 40 minute treatment on one side of the head. You might get a second treatment on the other side for 20 minutes. I’ve had one protocol called “Thetaburst” on a machine called the MagVenture that only lasted about 7 minutes. It totally depends on the machine, the doctor, and what you’re being treated for—anxiety, depression, both, etc. Do you have to stop taking your anti-depressants or stop going to therapy? Nope! I’m still on several of the same medications I was on when I started TMS in January of 2016. Follow the advice of your TMS psychiatrist and your regular psychiatrist and communicate with them. 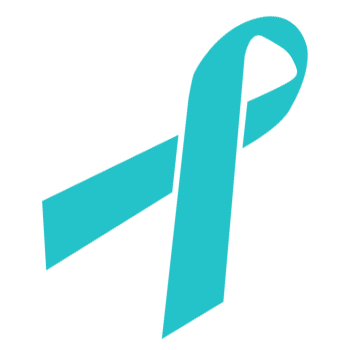 The most important part of TMS is that you have an aftercare plan. Continue seeing a regular psychiatrist and therapist when you leave, to continue good mental health practices, and the second you notice something is wrong, get right back in to see your TMS physician. Didn’t you have this and then relapse a bunch? Yes. And then I went back to TMS. When I first started TMS, I was told I had a 70% chance of relapse given my medical predispositions, but a 90% chance of TMS working again. I did it anyway, because honestly, those odds are still pretty good. It’s true. I have relapsed more times than I can count with this illness throughout my life, which is why now that I’ve found the treatment that alleviates pain the best, I’m not letting go. A lot of medications don’t work on me. It’s always very “guess and check.” But TMS is much more consistent. It keeps working, just like how Cognitive Behavioral Therapy has been steady with me, it just needed something else to boost it. But how can you say it worked? How do you know it worked? How can it be working if you keep relapsing? When I relapse, I go into a state where I physically and emotionally cannot function in the world. I withdraw. I stay in my room out of fear, not enjoyment. I don’t engage with my family, my dogs, my friends. I don’t respond to texts, tweets, posts, anything—because just holding myself together and just breathing is too much. There are varying degrees of relapse for me, but the worst is when I feel too scared to talk to my parents. I know I need help the most when I’m the most afraid to ask for it. When I’m good, when therapy, medication, everything works? I’m not necessarily jumping off the walls happy (although sometimes I’m laughing hysterically at my own jokes)—but I’m in and a part of the world. I’m running errands. I’m driving myself places. I’m making plans. I’m responding to texts (or forgetting to because I’m actually busy.) I’m doing laundry and making dinner or getting Orange Chicken at Panda Express. I’m procrastinating something and binge watching ER because it’s FUN, not because it’s my only coping mechanism. When I go from hibernation to living, and living for extended periods of time, that’s how I know TMS is working. What are the requirements to get TMS? I can’t speak for all treatment centers and insurance companies, but I had to verify that I’d undergone Cognitive Behavioral Therapy, had tried at least four different medications in the past (try 25+), and my psychiatrist wrote a referral for me. People with metallic objects in their heads are ineligible for TMS. 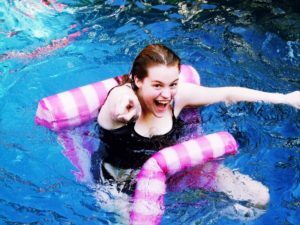 Why do you keep writing about TMS, a depression treatment, on your blog about dysautonomia? When I was 21, I was supposed to get ECT. It took me months to come to that decision. It was one of the scariest and hardest decisions I ever made. When my psychiatrist first told me he wanted me to have ECT, I started hyperventilating, crying and nearly ran out of his office. (I was instantaneously reciting Sylvia Plath while scenes from One Flew Over the Cuckoo’s Nest played in my head. NOT PLEASANT.) My doctor calmed me down, explained what modern day ECT is like, WOW we’ve made progress, and told me he really believed this could change my life for the better. I spent an entire summer talking with my family and my therapist about the decision—I learned how safe it was, but I also learned the risks, and I finally decided I was ready. That I was going to have it, I was going to get better and finally beat depression. And then my cardiologist who treats my POTS told me in no uncertain terms I was not to undergo ECT. That he would not be signing off on it. That while it’s incredibly safe for the average person, it was too risky with my POTS. We needed to find something else. 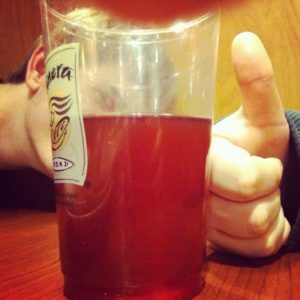 I went back to my psychiatrist. I was broken. I had been so ready for this huge step, and now it was whisked away. For over half of my life, I had tried everything to fix my depression, and now my last option, ECT, had been taken from me. That’s when we started talking about TMS. It had never been in the picture before because it wasn’t covered by our insurance at the time and the out of pocket cost was $15,000. At the time of that initial conversation, I was stable. We did everything we could to sustain it, and it lasted about a year. And that’s when we turned to the insurance company, got TMS approved (by the grace of God), and started the process in January of 2016, when I was 23 years old. Many psychiatrists believe ECT is the most effective way to help patients with severe treatment resistant depression. But for many patients who also suffer from dysautonomia, it’s just not an option. And it’s a really, really, really good one. Depression seems like it should be so easy to cure. Exercise, eat well and hydrate. Think happy thoughts and avoid things that make you miserable. Boom! Depression cured. It’s so simple. Except it’s not that simple. It’s never that simple. Because depression is a monster. I followed this routine for 12 years with occasional periods of success. Those periods were marked by success in school, new friendships, personal projects and laughter. But overall, I had a lot of falls in my mental health. Over and over again. Each time I would stumble and fall, my therapist, psychiatrist and I would consult and we’d create a new plan of attack. How can we approach this depression differently? What makes this situation different? What have we learned in the past that we can use now? But by the time I entered my 20s, I was exhausted with picking myself up after these falls. Not only was I picking myself up, I was picking up over a decade of emotional baggage that I couldn’t shed no matter what I tried. We considered different intensive treatment options over the years that ended up not working out for a myriad of different reasons. But in the fall of 2015, my psychiatrist proposed something new. He pitched it as a funky magnetic device they’d put on my head, my scalp would feel tingly, and afterwards my depression would be gone. It’d take a bunch of sessions but my depression would just go away after a while. Minimal to no side effects. The only catch was that my insurance might not cover it and it cost $15,000 out of pocket. We nervously sent in a request to our insurance and went around to my doctors to see what they thought. 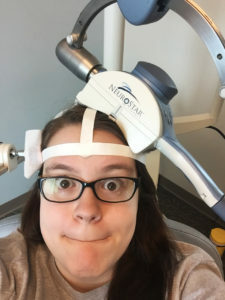 As we learned more about TMS it seemed like the perfect procedure for me. It got my cardiologist’s approval—he wasn’t worried about any interference with my dysautonomia. My psychiatrist was excited about it, he couldn’t wait to see how effective it was. And my therapist loved how hopeful I was. She liked the science of it, she liked the promise of it, she liked my enthusiasm about it. I had tried Cognitive Behavioral Therapy. My psychiatrist believed I would benefit from TMS. The psychiatrist at the TMS practice believed I was a great candidate after reviewing my records and meeting with me. The day I was approved by insurance, I cried so many tears of joy: this was happening. This was promising. This could be life changing. We’d start right after the new year. TMS is the most bizarre medical procedure I’ve ever had. this creepy chair will make you not depressed! You go into a room and get into a very interesting looking chair. They put a weird paper crown around your temple that velcros into the machine to hold your head in place. (I always thought it would be a really good base for a flower crown and considered taking some extras home and using it as such.) You put ear plugs in. They raise the chair up and lean you back. 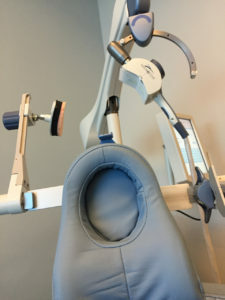 They put your head in place and align you with weird protractor looking tools that are attached to the chair. They bring down the coil/magnet and place it against your head. They bring down the counter pressure place it against the opposite side of your head to hold you in place and to make sure your neck doesn’t hurt from the weight of the magnet. They turn on the machine. It feels like a woodpecker is trying to get through your skull into your brain at first, then you get used to it. But nothing is touching your skull. It’s just magnetic pulses. It’s uncomfortable but not painful. this machine doesn’t lend itself to taking good selfies, believe me, I tried. Half way into my treatments, I met with my TMS psychiatrist and we decided to add in a second treatment (called bilateral treatments) every day for anxiety, because my symptoms of depression were getting better but my symptoms of anxiety were not. So every day, I had 40 minutes of !dundundundundundundundundun! followed by a break and repeat on the left side of my head and 40 minutes of a slow, !tap, tap, tap, tap! on the right side of my head. I got to watch TV or listen to music during my treatments. I became friends with all of the technicians who would check in on me, ask me how I was, check to see that I wasn’t feeling too paralyzed while strapped into the chair and the machine. I had almost all of my appointments (36 of them!) at the same time every day and fell into a comfortable routine. I’d watch reruns of Saturday Night Live on Vh1 and had a habit of laughing a little too hard during Weekend Update and would occasionally disrupt my placement in the machine—the machine would recognize that my head was no longer in the right place, sound an alarm, and the technicians would come back in, fix the positioning, and watch the rest of the segment with me because clearly, it was hilarious and worth watching. I started getting up a little earlier. I started making plans and schedules. I thought about things I wanted to do and took the steps to do them. I was approaching problems exactly the way my therapist and I would practice in therapy. The negative voice that lived in my head was spending less time there. And when I was anxious, I had more energy to remedy the anxiety. These positive steps started happening only two weeks into the six weeks of treatment. By the end of treatment, I felt better than ever. I felt like I was learning to walk on new legs—still nervous about this new life in recovery from depression, a little apprehensive about what post-depression life would be like, but ready. At my final appointment, my psychiatrist in charge of my TMS gave me a few statistics to keep in mind. Due to the severity of my depression and how long I’d been living with it, I had a 70% chance of relapsing. But because of how successful TMS had been, I had a 90% chance of it working again if I got a second round of treatment. I took those numbers to heart, repeating that 90% statistic every time I got nervous about relapse. I was high risk, but it was almost definite that I could get back to that amazing state of recovery again. We now knew what my brain required to get out of depression: it was TMS. A month after TMS, (this March) I relapsed. I met with all of my doctors and we agreed that I should get back into TMS. Everyone agreed that TMS gave me relief like I’d never felt in 13 years and the severity of my depression just needs more intensive treatment. I needed a second round of treatment. We sent the request into my insurance company and are currently in a battle with the appeals process because they deem it “medically unnecessary.” My insurance company is the only thing getting in the way of me and a cure for depression—because like most families, mine does not have $15,000 laying around to pay for this treatment. We use our money for things like food. And shelter. And paying for medical insurance that later screws us over. I’m going to hold on to hope that the appeal will work out because I want to live life free of depression for longer than weeks at a time. I have an idea what I can be beyond my depression and it’s pretty great. I want to be be that productive, be that worry free, feel that light and think that clearly. I know that I deserve that. And somehow, it’s magnetic pulses on my brain that can give me that. I medically withdrew from college my freshman year. Some of it was possibly due to physical stress (my undiagnosed POTS), but the primary reason was due to my depression and anxiety. This is the full, gritty, unabridged version of my experience that I have never really gotten into. 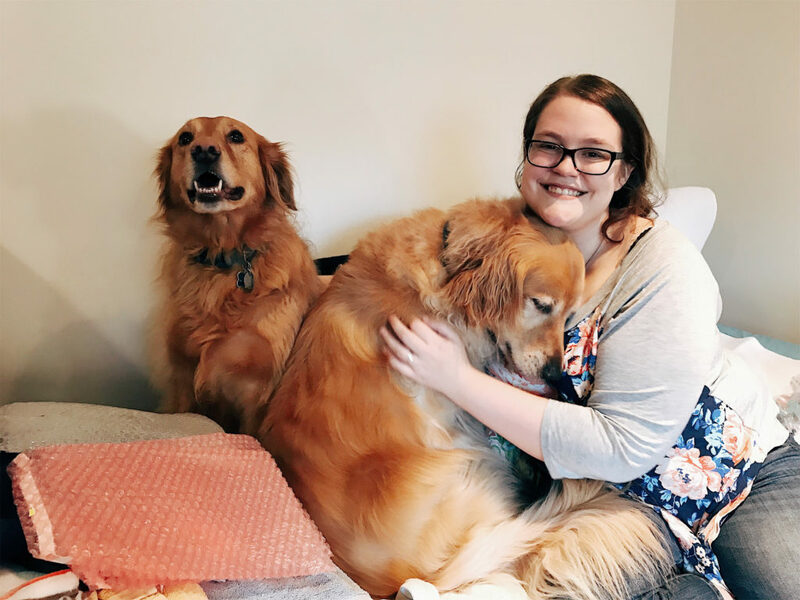 But because it’s Mental Health Month and graduation season and because it’s been four years since I left and because I imagine there are so many others out there just like me who feel as alone as I have felt–I want to put this out there. 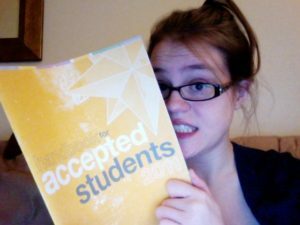 At the beginning of my senior year of high school, I was completely disinterested with the idea of college. I’d say flighty things like, “I don’t even want to go to college, I just want to move to New York City and BE there.” At the same time, my depression was beginning to slip slowly but surely. I had a major meds change over winter break which led to a massive depressive episode. I missed about a month of school because of my depression—my social life was the only thing that suffered more than my academics. College still didn’t seem appealing, but I knew I had to go. It’s what 18-year-olds did. It’s what I was going to do, come hell or high water. After a month of agonizing, I chose my college by flipping a coin in a shopping mall parking lot. It was either VCU or “making an informed decision.” Sure, the informed decision could have ended up being VCU, but I thought it might’ve been Marymount—close to home with a $15,000 scholarship. I had gotten into a bunch of schools in New York City as well, but I knew that wasn’t going to happen, not after the events of January. And February. And March. After all sorts of threats from my school administrators (“you need to get your act together!” and “you might not graduate!”) I graduated with a 3.7 GPA for the year and with a special letter in my diploma packet marking me an AP Scholar with Distinction. I had a smug smile when I shook my guidance counselor’s and assistant principal’s hands at graduation—it was never my intelligence or competence that should be called into question, it was always the depression. 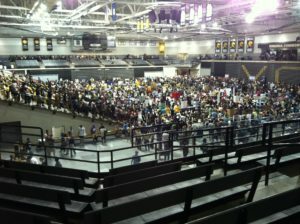 I left for VCU on August 20, 2011. I was placed in disability student housing which got me my own room in an apartment style suite with one other girl who was nice but we didn’t really click. I got a job my first week on campus as webmaster of the college newspaper. It was practically my dream job, it was the same sort of stuff I did in high school. I wandered around campus and tried to find things to do but was overwhelmed by my social anxiety. I tried. I tried so, so hard. But I wasn’t interested in partying and my dorm didn’t lend itself to open door policies where you could wander in a room and make friends. I was asleep, in bed every night by 11. I was close to a perfect student. I never skipped class. I did homework on weekends. I even joined study groups with random classmates around midterms. But it was impossible to make friends. I finally ran into two people I knew from high school—I was close with each of them at different times and they quickly became my favorite people in the world. We got meals together frequently and when I was with them, I felt like maybe I was getting a hang of this college thing after all. My heart ached in ways I didn’t think possible when I talked to friends at other schools. They went on about how much they were loving college life and about all of the friends they were making. They’d ask me about the people I was meeting, they all expected me to have dozens of new friends and new experiences because I was pretty social at home. I didn’t know what to tell them. I felt ashamed and embarrassed—I wasn’t good at the college thing, I needed to try harder, do better. I kept putting more on myself. But at the end of every class I was exhausted and wanted to pull into myself like a hermit. I went to group therapy provided by the college counseling center. I kept in touch with people. I had a couple of friends. But it was never enough. I was never enough. I went home as often as my parents were willing to pick me up. I’d blame it on things like, “I miss my dogs!” or “I need to do laundry” but that was never it. I just didn’t want to be alone, in my dorm, on a Saturday night at college. At home, I still cried myself to sleep. It didn’t matter where I was, I couldn’t escape my depression and the feeling that I was failing at college, failing at being 19, failing at young adulthood. Things didn’t go so smoothly when I went back for spring semester. I started skipping classes. I started getting headaches that altered my ability to walk, see and keep my balance. I started procrastinating and blowing off assignments. I started to say things like “do you ever wish you could screw up in a really permanent and irreversible way?” often. It might’ve seemed out of the blue to the people I said them to, but it was on my mind constantly. I needed something to change in a major way because I felt like I was going to explode at any given moment. I remember one session in group therapy where I felt so unbearably low that I didn’t know if I’d ever be able to come back up for air again. I cried to myself the rest of the session. I went home for spring break and saw my psychiatrist for a meds check. I was blind to how awful things were at the time and I felt like he had punched me in the gut when he told me he wanted to pull me out of school for two weeks. I couldn’t believe that he was doing this NOW. I had begged him hundreds of times to pull me out of school as a teenager and he had never relented but now, now when my education mattered the most, he was finally doing it? As I cried, he and my mom discussed whether or not medically withdrawing for the rest of the semester would be a better option. I cried for hours that day because I couldn’t admit how bad things were. I finally decided to medically withdraw for the semester after talking to my parents. While I was home, they had both said “we support you whatever you choose” and “we want you to do what’s best” in as many different ways as they could think of. But when the three of us sat down together, they both said it with tears in their eyes. I spent my entire childhood and teenage years sick in different ways–physically and emotionally. 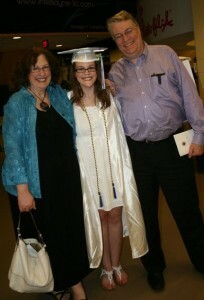 My parents were always worried and concerned, but I rarely ever saw them cry over me. They always kept their composures strong so I didn’t have to worry. I went back to working with my regular therapist. We covered some topics that were painful to talk about but it was a relief to be back in my safe space. My psychiatrist started changing my medications around in the hopes we could find a new combination that worked. In the meantime, my eating and sleeping were erratic despite my best efforts. My stomach acted up frequently. I cried all the time. But I knew things were going to change. It wasn’t like they were at school—I had my team of doctors and a constant support system with me this time. I never made a formal announcement to friends that I had medically withdrawn—I considered it a need-to-know basis. I got nervous each time I said those words, “I medically withdrew” but it got a little bit easier each time. People were either kind or indifferent each time I said them. I kept on going. I got a job. I tried to get over the pain of feeling like I’d failed not only at school but also at being young, being social, being alive. Four years later, it still stings, but I’m feeling a little better. I know without a shadow of a doubt that I did the right thing but I’m sad that I couldn’t have done “the college thing” the way I had so stubbornly planned. College has so many expectations tied to it. This is where you find yourself. This is where you make your lifelong friends. This is where you discover your passions. I didn’t care about any of it at first, but once it was being torn from me, it felt like my entire world and my entire future were shattering and I’d never get it back. I have thought about going back to school full time but it hasn’t been in the cards for me. Since I left, I’ve tried my hand at a bunch of different options. Working, going to school part-time, being a chronically ill patient full time. Depression won this particular battle but that doesn’t make me weak. Leaving was necessary. Had I stayed, things only could have gotten worse. I left and got the help I so desperately needed. I left and realized that college was not right for me at that point in my life, even though I grew to want it so, badly. The most important thing I learned is from my therapist who told me to give myself permission to mourn the loss of what was and what could be. She reminded me to not let it consume me, but it’s so important to acknowledge the loss—it’s OK to be sad over that. It’s natural to be sad over that. I’ve used that in so many different areas of my life. It’s a reasonable sadness. It’s OK to mourn the days, months and years of your life lost to depression as long as you don’t let it destroy you and you don’t hold yourself responsible for it. I didn’t choose depression. I make choices every day that will create an environment where happiness and stable mood have the best chance at succeeding. But I also acknowledge that depression has taken a lot from me, all beyond my control. If depression wins some battles here and there, it doesn’t mean I didn’t put up a good fight. My path won’t be the traditional one I wanted, but it can still be great. Happy Mental Health Month! And I do mean happy, because it’s an awareness month, and awareness should always be celebrated. This blog is all about dysautonomia but I want to focus on topics relating to mental health this month. Dysautonomia does not necessarily mean you will experience a mental health crisis, but mood can be disrupted by the autonomic nervous system, as can life with a chronic illness. Regardless of dysautonomia’s role or presence, mental health is worth talking about because the more we talk, the less stigma exists. Let’s take the stigma, examine it closely and then completely destroy it. Smash it into a billion tiny pieces. I don’t like it. I try to write the words “I have depression” as much as possible on this blog. I’m making up for all of the times I had the opportunity to say it in real life but felt too scared to open my mouth and say the words. I was afraid that people would think me weak. I was afraid that people wouldn’t believe me. I was afraid that people wouldn’t understand. I was afraid that people wouldn’t care. I did say these words in doctors’ offices. I said them in hushed tones to new teachers so my classmates couldn’t hear. “I have depression and health issues, so this is a note from my mom explaining some of my problems,” I’d say at the beginning of every year to my teachers because my school refused to give me a Section 504. But I rarely said those words, “I have depression,” to my friends and peers. A few times I wrote them out in a letter because opening my mouth to let them linger in the air was too scary. Part of the reason the words “I have depression” and the associated explanations were so hard was because it didn’t fit my image. It didn’t fit the girl who would do anything to get the first and last laugh. It didn’t fit the girl who could recite episodes of The Office and The Colbert Report verbatim. It didn’t fit the girl who was a little more than power hungry on her high school newspaper. Additionally, hiding depression to my peers came naturally for me. I put on the brave face outside and broke down at home and in safe spaces. The depression got to a point in high school where hiding things was no longer an option. I couldn’t keep up the charade. People could tell something was very wrong because my spark was gone and I was openly sad–I didn’t have the energy to fake it. I’d gone through depressive episodes before (pretty much one a year), but the episode my senior year of high school was more powerful and harsher than I’d felt before. A friend from school was giving me a ride home one day and she asked when “the real Shannon was coming back.” I paused and said I didn’t know. It caught me off guard, in that moment I thought I was acting like Real Shannon. Turns out, during depressive episodes, I wasn’t fooling anyone. This was the first time in my life that I had to face the reality of living an open and honest life… and it was terrifying. I want to take the power back. I don’t want to feel like I have to hide because I’m afraid. I want to be able to talk about all of my mental health conditions. That doesn’t necessarily mean that I will, but I want the option. Hiding yourself in fear is no way to live.